Drunk Driving Accidents per Year in DFW | Branch & DhillonBranch & Dhillon, P.C. With so many hazards and careless drivers on the road, it’s often dangerous to be on the road. Roads are made even more dangerous by the people who make the terrible decision to drive drunk. Those who make this reckless decision put their lives and the lives of everyone around them at risk. So just how bad is the drunk driving epidemic in the Dallas/Fort Worth Metroplex? Below are the drunk driving statistics in the area for the last three years. 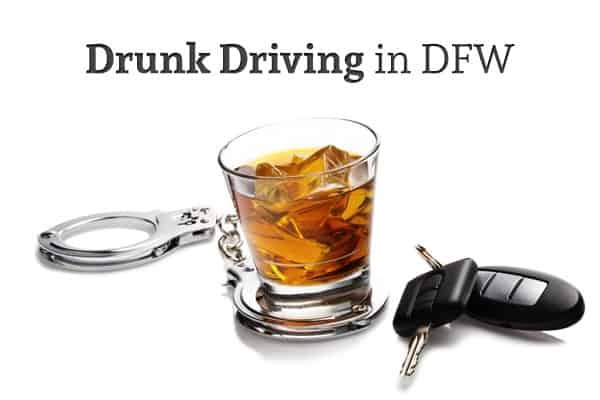 In 2015, DFW saw 5,821 drunk driving car accidents, which comes out to about 16 per day. Below are the statistics for the 10 most populous Dallas/Fort Worth cities. Irving. It may surprise you that Irving topped the list of highest percentage of drunk driving accidents in 2015. Irving had only the fourth highest number of crashes at 280, but that comes out to 118 drunk driving crashes per 100,000 people. Out of those 280 crashes, 8 of them were fatal crashes, leading to 9 fatalities total. Arlington. As home to the Cowboys Stadium and the Rangers Ballpark, it’s not much of a surprise that Arlington is high on this list. Arlington had the third highest number of crashes, behind only Dallas and Fort Worth. Altogether, 112 out of every 100,000 people caused a drunk driving crash in Arlington. The city saw 435 crashes, 9 fatal crashes, and 10 fatalities caused by drunk drivers. Plano. Plano is a growing city that experienced 97 out of every 100,000 people causing a drunk driving crash. The city had the fifth highest number of drunk driving accidents at 274, with only 3 of them leading to fatalities. Dallas. Dallas is the biggest city in DFW and saw the most total crashes in 2015 (1254). 95 out of every 100,000 people caused drunk driving crash, leading to 47 fatal crashes and 54 fatalities. Mesquite. Although it’s only number 10 population-wise on this list, Mesquite saw the fifth highest percentage of crashes caused by drunk drivers (89 per 100,000 people). The city had the eighth highest number of crashes (129) and saw 5 fatal crashes. Grand Prairie. If you’re traveling between Dallas and Fort Worth, you’re almost certain to drive through Grand Prairie. 86 out of every 100,000 people in the city caused a drunk driving accident; Grand Prairie had the sixth highest number of crashes at 161, 5 of which lead to fatalities. Fort Worth. Fort Worth is the second biggest city in DFW, but it’s actually a pretty safe place to live. 77 out of every 100,000 people in Fort Worth caused a drunk driving crash in 2015. Although Fort Worth has about ⅔ the population of Dallas, the city only had about half as many crashes (638). 19 of those crashes led to fatalities, with 20 deaths total. Garland. Garland had 130 drunk-driving related accidents, 4 of which were fatal. 55 out of every 100,000 people caused a drunk driving crash in 2015. Frisco. This is the only city on the list that didn’t suffer from any drunk driving-related fatalities. Altogether, the city saw 77 crashes, which were caused by 50 out of every 100,000 people. McKinney. As a city on the outskirts of DFW, it’s no surprise that McKinney is last on this list. 47 out of every 100,000 people caused a drunk driving accident; there were 76 drunk driving accidents total with only 1 fatality. The total number of drunk driving accidents went up from 5,821 in 2015 to 6,007 in 2016. Mesquite. In 2016, Mesquite made a huge jump from number five to number one. 122 out of every 100,000 people caused a drunk driving accident. Total number of accidents was 177, with 5 fatal crashes and 6 deaths. Arlington. Arlington stayed fairly consistent, again at number two. Total was 116 out of every 100,000 people causing drunk driving crashes, with 451 crashes and 4 fatal crashes. Dallas. Dallas rose from 4 to 3 with close to 100 drunk drivers per 100,000 people causing accidents. Total number of crashes was 1,311, and there were 52 fatal crashes leading to 56 total fatalities. Plano. This city switched places with Dallas. Drunk drivers who caused crashes: 86 out of every 100,000 people. Total crashes: 245. Total fatal crashes: 6. Grand Prairie. Grand Prairie moved from number 6 to number 5. Drunk drivers who caused crashes: 84 out of every 100,000 people. Total crashes: 158. Fatalities: 3. Fort Worth. Fort Worth also moved up one place. Drunk drivers who caused crashes: 75 per 100,000 people. Total crashes: 624. Total fatalities: 21. Irving. This city made significant improvement, moving from number one to number seven. Drunk drivers who caused crashes: 66 per 100,000 people. Total crashes: 157. Fatal crashes: 11, leading to 14 fatalities. Garland. Again at number eight is Garland. Drunk drivers who caused crashes: 57 per 100,000 people. Total crashes: 134. Fatal crashes: 13, leading to 17 fatalities. Frisco. Frisco didn’t move either, and the city still didn’t have any drunk driving fatalities in 2016. Drunk drivers who caused crashes: 54 per 100,000 people. Total crashes: 83. McKinney. And again in last is McKinney. Drunk drivers who caused crashes: 50 per 100,000 people. Total crashes: 81. Fatalities: 2. Drunk driving accidents went down to 5,589 in 2017 – which is around 15 a day. Arlington. 117 drunk driving-related accidents per 100,000 people. 453 total crashes, 9 fatal crashes, 9 fatalities. Mesquite. 114 drunk driving-related accidents per 100,000 people; 453 total crashes; 4 fatal crashes; 5 fatalities. Dallas. 97 drunk driving-related accidents per 100,000 people; 1278 total crashes; 62 fatal crashes; 70 fatalities. Grand Prairie. 78 drunk driving-related accidents per 100,000 people; 147 total crashes; 6 fatal crashes; 8 fatalities. Fort Worth. 67 drunk driving-related accidents per 100,000 people; 560 total crashes; 17 fatal crashes; 19 fatalities. Garland. 54 drunk driving-related accidents per 100,000 people; 128 total crashes; 2 fatal crashes; 3 fatalities. Irving. 51 drunk driving-related accidents per 100,000 people; 121 total crashes; 5 fatal crashes; 5 fatalities. Plano. 45 drunk driving-related accidents per 100,000 people; 128 total crashes; 4 fatal crashes; 4 fatalities. Frisco. 44 drunk driving-related accidents per 100,000 people; 68 total crashes; 2 fatal crashes; 2 fatalities. McKinney. 39 drunk driving-related accidents per 100,000 people; 63 total crashes; 3 fatal crashes; 3 fatalities. If you’ve been hit by a drunk driver, you’re not alone. Not only are there a large number of other people who’ve been in the same situation, but you’ve also got a dedicated law firm who will fight to get you compensation for your damages. Branch & Dhillon in Arlington, TX has a team of lawyers who are experienced in personal injury law and with helping car accident victims get justice. Call their office today to schedule a free consultation. What are the Symptoms of Traumatic Brain Injury (TBI)?